Our first stop in Italy was Lucca, a town known for it’s surrounding ramparts and Romanesque style within the town walls. Since we arrived in the evening, we spent our first night wandering the town. The old churches, cathedral, and medieval walls were all dramatically illuminated, making the architecture tower above. Although, the town within the walls was relatively quiet, we came across many couples and locals enjoying the tranquility. Food was consistently amazing–you know we enjoy eating through our travels. One highlight was Locanda Di Bacco, Via San Giorgio 36, where we had a fantastic lunch. Zookie won the heart of our waitress (yet,again). So while we were enjoying our fine cuisine, Zookie got a fresh bowl of water to keep him occupied. One of the best parts of Lucca, were the Ramparts. During Lucca’s history, they invested nearly a third of their income in these protective walls, which today serve as parks and running/bicycling paths. We took advantage well maintained walkways atop the ramparts and rented bicycles for the day to enjoy the views. Zookie came along and ran alongside as we biked the ramparts. 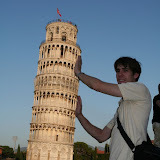 The next day we set out for Pisa – yep the one one with the original leaning tower. Because Pisa is so over run with tourists and the sights are concentrated in a small area – we planned to just spend a few hours there on our way to Florence. The very touristy center of Pisa, the Campo dei Miracoli (Field of Miracles) is scenic array of grand Romanique buildings: The Leaning Tower, Duomo or Cathedral, and the Baptistry are the stand outs. We spent time exploring the Duomo/Cathedral and the Baptistry. Each building shows just how powerful Pisa was during the 1200’s. The Cathedral contained a masterpiece marble podium sculpted by Giovanni Pisano (his father, a fellow sculptor, carved the pulpit in the nearby Baptistry). Finally we made that long and very slanted climb up the leaning tower. Structural improvements in recent years has opened the tower up to tons of tourists clambering to the top. Sidenote: Having grown up in Evanston, IL, I often drove by the Leaning Tower of Niles – now I can say that I experienced the real thing. After a few hours in Pisa we grabbed a mediocre, but not horribly overpriced, gelato and hit the road again: destination Florence.